Your donation is Tax Deductible to our 501C3 organization. To Help Active Duty Military, Veterans, First Responders, Families, Companies Hiring Veterans and Military Spouses and Helping those who Serve(d)! To Help Military Support and Veterans nonprofits with getting their mission and message out to more who are or have served and families. And to Help For Profit Companies who are Hiring Veterans and Military Spouses and who are Helping Veterans Service Organizations (VSO) and Non Profit Support Groups! To offer on a new Social Media Platform Collaborator Channels to Military Support and Veterans Groups and their Families, Companies, Individuals and Professional people who are Honoring and Helping those who have or are Serving and their Families! As of November 17, 2017, we are a 501 C3 non-profit organization. 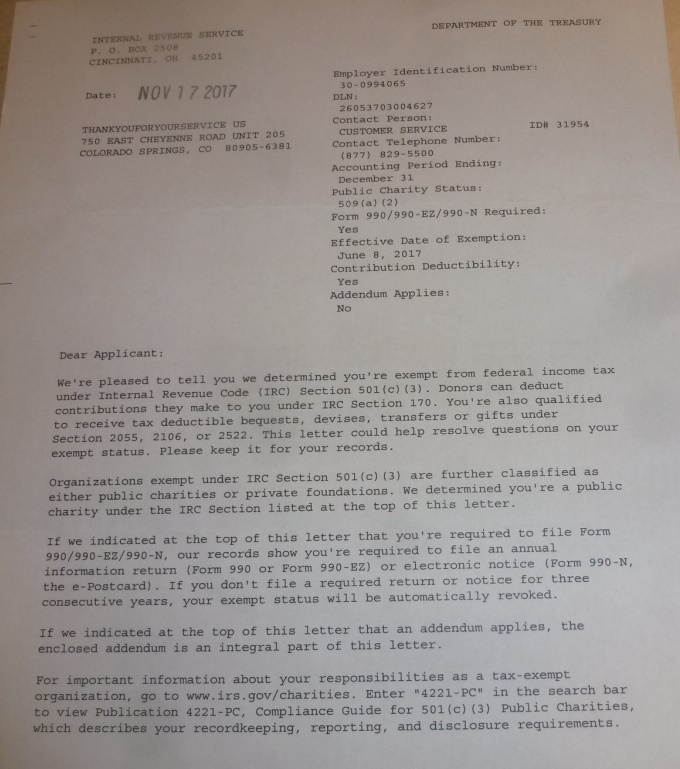 Click here for IRS Letter. Supporters Donating an amount they can afford will have the option of being thanked on the Sponsors Page with text info that could include their website address, in the order of the amount of their donation up to $100. Sponsors Donating $100 or more per year will be listed on the Sponsors Page with their logo linking to their website above the Option One Sponsors. Advertisers/Sponsors with a donation of $2,000.00 will have their logo in an image file linking to their website at the left or right sideof our ThankYouforYOURServiceUS Home Page for two years!